Woo hoo! It’s HOT! What we need is…...The Freshmaker!! DO pass Go, DO collect a savings of $13 a bottle, do go on to savor the oh-so sweet satisfaction of drinking a jump-in-a-cold-stream streaking of exhilarating, pure, clean freshness (hey, wait, is this a Mentos commercial?) ITALIAN ROSE! Nope, no candy, we’ve just got an utterly SCREAMING deal today (for the 1.6 hours that it will last, anyway…) on a Veneto classic!! Located near Verona in the province of Veneto in northeast Italy, Casa Vinicola Bertani is one of the region's most important and influential wine producers. And, somehow, through charm and grace and good looks, we scored a parcel at a simply ridiculous price. GO, go, go -- it will sell out fast. Hey, you’re savvy, you KNOW exactly what this is going to be --- we’re super picky about everything, but with rose, well, it’s gotta be immaculately clean and uber-fresh. No poky edges, lilting about with light scents of strawberry, cherry, maybe a hit of almond, a dash of light spice but mostly just ZINGY and wakey-wakey delicious. It’s pretty simple, but only a few make the cut…. At this price?? Throw a few cases in the cart, and drink it instead of water for the rest of the summer! While it lasts…! Located near Verona in the province of Veneto in northeast Italy, Casa Vinicola Bertani is one of the region’s most important and influential wine producers. 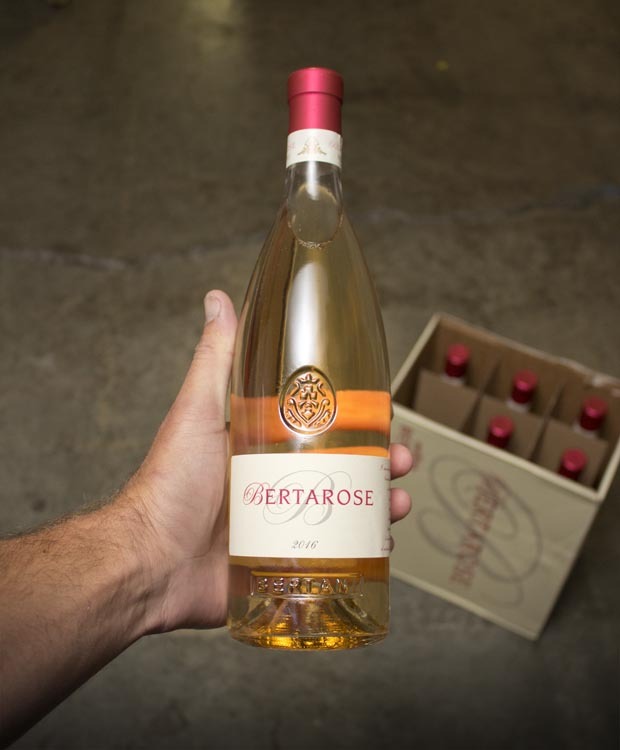 Bertani produces a full spectrum of the classic wines of the Veneto and has enjoyed a reputation for quality from the start. Bertani owns vineyards and cellars in the Valpantena as well as land in the Soave area and in the areas around Lake Garda. The company headquarters are in the original cellars in Grezzana, north-east of Verona, where the historic vineyards are still to be found and where the work of vinification, aging and bottling take place today. Aging/Cooperage: The two grape varieties are vinified separately, using an innovative on-the-skins fermentation for the Molinara and off-the-skins fermentation for the Merlot. Harvest Date: Harvesting takes place at the end of September. Bertani was founded in 1857 by brothers Gaetano and Giovan Battista Bertani, prosperous wine merchants who believed that quality winemaking held the key to the future. The Bertanis invested their funds in buying some of the finest vineyards in the province and making their own wines. As a result, unlike most other local producers, Vinicola Bertani owns its own vineyards and so is able to oversee the entire winemaking cycle from start to finish.